1. The Dead Sea traces back over 3 million years. 2. The Dead Sea isn’t a sea at all - it’s actually a hypersaline lake. 3. With a depth of more than 1,200 ft. deep, the Dead Sea is the deepest hypersaline lake on Earth. 4. The Dead Sea is located in the Middle East between Jordan (to the east) and Israel (to the west). 5. The Dead Sea lies on the Jordan Rift valley, a 4,000-mile fault line in the earth’s crust. 6. The lowest road in the world at more than 1,300 ft. below sea level, Route 90, passes by the Dead Sea. 7. Water flows into the Dead Sea from streams and rivers, but does not flow out. 8. The high mineral and salt content of the Dead Sea makes the water uninhabitable for fish and plants. 9. The Dead Sea is the second saltiest body of water in the world, after the Don Juan Pond in Antarctica. The salt content of the Don Juan Pond is 40%, the Dead Sea is 33%. Typical ocean water is approximately 3.5%. 10. The unique mineral composition of the Dead Sea has been known to help treat acne, psoriasis, hives, cellulite, dry skin, dandruff, stress, muscle aches, and more. 11. According to published studies, about 80%-90% of psoriasis patients visiting the Dead Sea for treatment experience significant improvement in their skin. 12. The minerals found in Dead Sea Salt naturally occur within our bodies. 13. 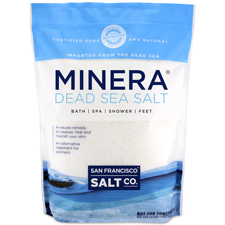 Because of Dead Sea Salt’s unique mineral composition, Dead Sea Salt is not suitable for consumption and is for bath/spa use only. 14. The high concentration of minerals in the Dead Sea gives Dead Sea Salts their strong mineral scent. The small inorganic specs you may see in salt are natural earth elements that, like the mineral scent, are characteristics of genuine Dead Sea Salts. 15. Asphalt often rises to the surface of the water in the Dead Sea, although nobody knows for certain why it rises to the top. 16. Ancient Grecians noticed the large asphalt blocks that rose to the top of the water and named the sea “Lake Asphaltites”. 17. Egyptians used Dead Sea Salt Asphalt from the Dead Sea in their mummification process. 18. Dead Sea Asphalt was also used as a natural biocidal agent in agricultural practices in ancient times. 19. King Solomon presented Cleopatra Dead Sea Salts upon her visit to the holy land, and a result she urged Marc Antony to conquer the region in his Judean campaign to obtain exclusive rights over the sea. She ordered costmetic factories and resorts be built along the shores of the Dead Sea. 20. The Dead Sea was also called the Salt Sea and the Eastern Sea in Ancient Times.